As we’re getting closer to releasing the Beta version of the Review.Network platform (scheduled for late 2018. ), we wanted to share our progress in more detail. Before we dive in, if you’re still not familiar with the disruption Review.Network is bringing to the review and market research industries, I encourage you to check out our website, explainer video 1 and video 2, as well as our one pager, tech one pager and white paper. Our dev and UX teams have been working hard on a lot of fronts, from white paper, blockchain layer solutions and the platform architecture, to multiple smaller web apps to support our efforts (private sale whitelist, pre-sale platform, main sale platform, Beta pre-registration…). Now, as we are moving closer to the ICO, we’re working extra hard to bring the Company web app MVP public, as we have gotten a lot of demand from people asking to try it out. This will also accelerate the process of signing up companies who wish to use Review.Network Beta for market research. 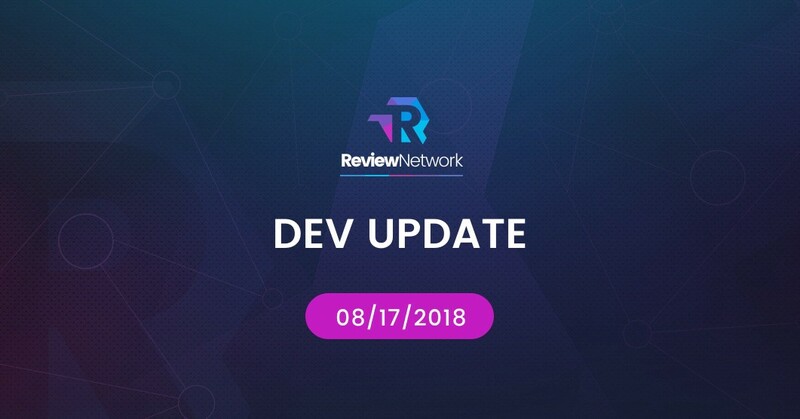 Review.Network Beta Signups — We have opened up Review.Network Beta signups once again, after reaching 100,000 pre-registered users. I am extremely thankful to our community for the interest they are showing, and frankly can’t wait to open the gates once Beta goes live so everyone can try it out. Bancor integration — As we announced this week, Review.Network plans to integrate the Bancor protocol after the public sale later this year. This will allow us to implement some very exciting use cases, like instant exchange of REW to Ether and other ERC20 tokens right from our app. This will allow for friction-less use of utility tokens and open the doors to real mass adoption of blockchain platforms. YouTube Live AMA — In our first AMA we’ve seen some great questions from the community. Thank you everyone for participating, it really felt amazing engaging with you all in real time! We are planning to do more AMAs in the future, because we have a lot of exciting things coming up that we want to talk about, and absolutely love answering questions from you guys. Switching to Rinkeby — Our MVP is now running on the Rinkeby testnet (it was previously on Ropsten). We made this move because of Rinkeby’s PoA testnet having faster block times and being more reliable overall. Release of the nano-faucet library — A while ago, we needed an easy way to seed new accounts in our MVP with testnet ether and REW during development. We shaped the solution into a simple library that allows anyone to deploy their own faucet in literal minutes, which is extremely useful for teams developing on Ethereum. Read more about why we created it and how it can be useful to you at https://github.com/ReviewNetwork/nano-faucet. We are closing in on the features of Review.Network’s MVP with regard to the market research web application.. It is an application that will allow companies to create surveys, distribute them to users and see up to the second real-time results, allowing for directly tapped in, real-time market insights. We have been updating our smart contracts to allow for more advanced features, like survey answer encryption. This includes adding a public key to a survey so users can encrypt their answers and send them over in a way that only the company that published the survey can decrypt and read. Encrypting survey answers is one piece of the puzzle to making commercial market research feasible over public decentralized technologies. It is important because it protects both user’s privacy (knowing you are anonymous and that no one can read your answers makes you answer more honestly) and company’s privacy (you wouldn’t want your competitors to see the results of a survey you ran and paid for). Next steps are updating our User MVP mobile app to work with these changes, thus completing the whole market research flow, after which we will focus on finalizing and polishing the UI. Don’t forget — your opinion matters. Let’s improve market research and online reviews together! Blockchain startup aiming to transform the way reviews work.